Charging dock. 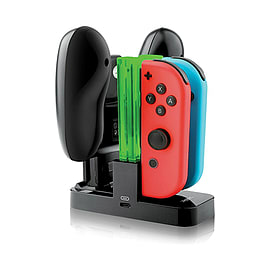 Charge your Joy-Cons and controller. Easily charge your Joy-Cons and Pro Controllers. Powered by USB to USB C Cable. Cool USB light bar indicators show charging status. Ergonomic design with weighted base for stability.